Robert Hunt, British photography pioneer, mid-19th century. 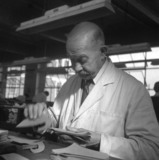 Man checking papers at a shoe factory in Leicester, 1950. Rolls of paper in the beater room, production of paper, 1936-42. Illingworth's Bromide Paper, c 1930s. Josef Albert, photographer, 19th century. Vatman forming a sheet of paper in Kashmir, India, 1917. Pulp and paper production, 1936-1942. Offloading moist paper pulp from barges to pulpsheds, 1936.